Cell-based assays to assess cellular immunity and multiple cytokine levels have advanced rapidly in the past decade. Cell expansion technology has emerged as a promising therapeutic solution for brain and spinal cord injuries, neurodegeneration, cardiovascular disorders, blood cell formation, diabetes, and a host of other conditions. It is also used in the diagnosis of some types of tumors. Additionally, cell expansion is used in the formulation of regenerative medicines for engineering, replacing, or regenerating human tissues, cells, and organs to establish or restore normal function. The global cell expansion market is primarily driven by the rise in chronic diseases, advancement in cell-based research technologies such as microcarrier-based systems, and increasing government investment to accelerate the growth of novel healthcare facilities. Cell damage from injuries and chronic diseases such as cancer and diabetes lead to tissue or organ damage and subsequently generate the demand for mass cell production. A wide range of cell expansion products are gaining importance and finding applications in clinical diagnostics, drug discovery and development, regenerative medicine, and stem cell research. The global cell expansion market totaled nearly $8.5 billion last year. BCC Research projects this market to reach $22 billion by 2020, reflecting a five-year compound annual growth rate (CAGR) of 17.8% for the period 2015–2020. For this forecast, BCC Research considered both animal and human cell types. As the larger segment of the two, the human cell market totaled nearly $6.4 billion last year, and is expected to reach close to $17.3 billion by 2020. End-users of the cell expansion market include hospitals and diagnostic centers, research and academic institutions, biopharmaceutical and biotechnology firms. Hospitals and diagnostic centers should remain the leading end-users through 2020, more than doubling this section’s 2014 value to $13 billion by 2020. Products used in the cell expansion market include consumables such as reagents, media, sera, and disposables; instruments such as automated cell expansion systems and bioreactors; and equipment including centrifuges, flow cytometers, filtration systems, microscopes, incubators, and laminar air flow cabinets. Consumables, the largest revenue-generating product segment, reached nearly $6.2 billion last year, and this category is expected to almost triple in value through 2020. Disposable (single-use) bioreactors are a noteworthy segment, due to their advantages of flexibility in production, less changeover time, among others. At 20.7%, the instruments product segment has the highest growth rate over the analysis period, due to the increasing use of cell culture-specific instruments and automated cell expansion systems. The application segment of the global cell expansion market includes diagnostics, drug discovery and development, regenerative medicine, and others. Among these, regenerative medicine is the largest application and generated revenue of $3.1 billion last year. However, diagnostics could show prominent growth owing to the advantages of cell culture for virus diagnosis, broad spectrum activity, and sensitivity. “Due to the redundancy of older technologies associated with cell expansion, and the frequent changes in product requirements, manufacturers have a difficult time choosing the layout of their manufacturing facilities,” Jeevane says. Nonetheless, companies must continually refine their strategies. For example, Lonza is planning to construct a new 100,000-square foot facility for viral and immunotherapy development and the manufacturing of cell therapy products. Changes such as this will affect the revenue-generation capacity of the market by 2020. Novel T-cell therapy manufacturing platforms, such as the G-Rex (Wilson Wolf) cell production technology, because of their specific advantages, will positively affect the market in the future. For example, the G-Rex technology provides cells with virtually unlimited oxygen and nutrients, unlike traditional technologies. It is also GMP-compliant, economical, highly reliable, linearly scalable to clinical doses, does not require specialized skills to operate, uses less space, needs minimal process monitoring, and QC measures are easily taken. Players in the global cell expansion market are adopting the strategy of product launch to expand their business horizons, products, services, and geographic presence. Companies active in the cell expansion market include Becton, Dickinson and Company; GE Healthcare; Thermo Fisher Scientific; Corning; Danaher; Merck Millipore; Terumo BCT; STEMCELL Technologies; Sigma-Aldrich; Miltenyi Biotec; Life Technologies; NexImmune; TC BioPharm; Pluristem Therapeutics; ReNeuron; Vornia Biomaterials; CellProthera; and Cytomatrix. The strategy of product launch constitutes 23.1% of all competitive strategies used and is the one used by companies most often. 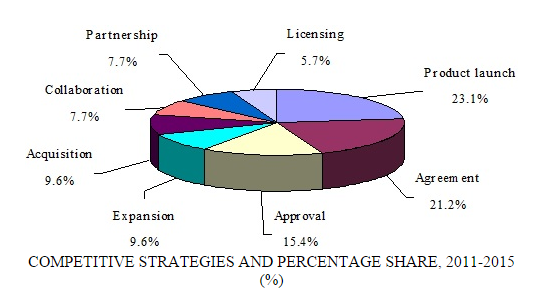 Agreement strategies make up 21.2% of all strategies used, and approval 15.4%. Expansion, acquisition, collaboration, partnership, and licensing are other strategies that have been adopted by players in the cell expansion market. Tracked clinical trials for the global cell expansion market show that the majority are currently being conducted for the treatment of diabetes, vision impairment, metastatic malignant melanoma, colorectal tumors, metastatic breast cancer, peritoneal cancer, ovarian and fallopian tube cancers, and for clinical products such as natural killer cells and T cells. Many of these clinical trials are currently in Phases II and III. Commercial approval and favorable regulation for stem cell research has boosted the scope of the cell expansion market in healthcare and biopharmaceutical research. The need for artificially derived human cell products also increases the demand for cell expansion. At the same time, growth is restricted by the high cost of cell-based research and cell therapy products. Governments of different regions have imposed stringent regulatory legislation for importing cell-based products. Also, ethical concerns continue to swirl around stem cell research. Nonetheless, cell expansion technologies have huge potential, largely due to the unavailability of effective substitutes for cell replacement therapy. The introduction of 3D technology for cell expansion has provided promising opportunities for this market. Additionally, emerging economies such as China, India, and Malaysia show tremendous growth potential for cell-based therapies in part due to medical tourism and affordability of treatments. The geographical segmentation of the cell expansion market includes North America, Europe, Asia-Pacific, and ROW. North America is the largest revenue-generating region, accounting for $3.7 billion last year and expected to reach nearly $9.2 billion by 2020. Such high growth is attributable to that continent’s increasing research on advanced biologics and biosimilar drugs. Well-regulated stem cell research institutes also contribute to the growth of the North America cell expansion market. Europe is the second largest market, due to its large number of biopharmaceutical clinical research organizations and diagnostic centers. In the Asia-Pacific region, the cell expansion market is projected to achieve a five-year CAGR of 22.2%, the highest among the geographic segments. The increasing cost of research in developed nations, the emergence of biosimilar research, and the transition of clinical research activities from developed to developing economies are prime reasons for this growth. BCC Research’s study, Cell Expansion Technologies and Global Markets (BIO144A), includes an analysis of applications, market dynamics, growth drivers and inhibitors, trends, and revenue through 2020.